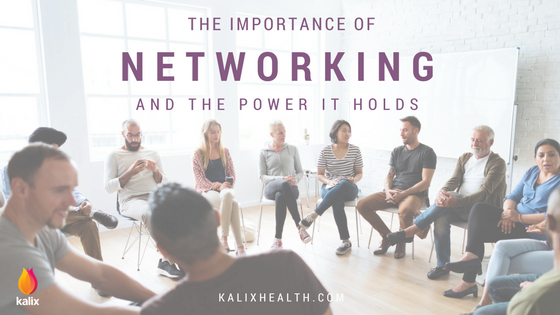 The Importance of Networking & The Power it Holds – The Official Kalix Blog. Networking is a form of communication, whether it be verbal or virtual, in which it allows you to promote and market yourself, your expertise in your specialty area, your brand, and your business. It also gives you the amazing ability to make connections, influence others and grow your clientele. Do you realize how powerful that is? This ability rests in your hands. For those of you just starting out in private practice, networking can be particularly essential and beneficial for your business. Keep in mind that networking involves both the giving and receiving in favor of all parties involved. Networking with others is so beneficial. It allows you to make connections with others, share information about your practice and meet people who can even help your practice potentially grow. Below are some more of the many exciting benefits. 1 – Connections – You are able to connect with a variety of people who can theoretically build your brand and increase clientele. 2 – Self Esteem Building – Meeting new people and networking causes a huge boost in confidence which allows room for growth in the areas of presentation, public speaking and marketing skills even more. 3 – Promotion – You are able to promote your practice. This is advantageous in numerous ways. 4 – Ability to Share Useful Information – This is of immense significance to your practice as it provides you with the opportunity to develop your knowledge, share knowledge with others, and obtain other pertinent perspectives that may actually help you in your line of work. 5 – Credibility – You are able to build a reliable and reputable character which could lead to increased levels of potential support from others. The ultimate goal of networking is to grow your business (brand) in every way, shape and form possible. Be sure to take a peek at next week’s blog as we discuss the top reasons why networking is best face-to-face!